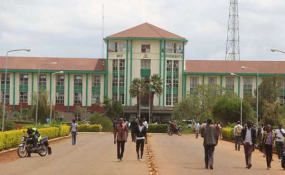 Moi University in Eldoret. Education CS Amina Mohamed has settled on Prof Isaac Kosgey as the new vice chancellor. Some of the cases, however, have burst into the public limelight. For instance, last month, a second-year law student at the University of Nairobi, who was on holiday, committed suicide in Nakuru a few days before he was to report back to the university's Parklands campus. The university's management acknowledged the incident but declined to reveal the name of the student. "We are aware of the death of the law student but he died while at home and therefore we are not in a position to tell what could have made him commit suicide," said Mr John Orindi, the university's director of corporate affairs. "He left behind a detailed account telling of the tribulations the couple had undergone since they first met at the university," said a report by Kongasis Chief Edward Barusei. Another case was reported at the campus but the management was unwilling to providedetails, saying they did not wish to further traumatise the student's family. The student, who was in his final year, committed suicide at his elder sister's house in Kasarani, Nairobi, a few days before he was set to sit for his end-of-semester examinations. Edwin Mwaizi Igunza's body was discovered by his sister, Ms Luize Minaywa Igunza, after she arrived from the family home in Kitale. In February, Derrick Kiprop, 22, a student at Murang'a University College of Technology, committed suicide after a dispute with his lover. He is said to have disagreed with his lover's decision to end their three-month relationship over irreconcilable differences. The third-year student was pursuing a degree in software engineering. Hellen's body was dangling from the ceiling of her rented residence at Chepnyogaa trading centre, a walking distance from the university. The 23-year-old, Sylvester Anyiko Majonjo, who was working at the bank as an intern, attempted suicide because he was being investigated after it was discovered that he had fraudulently transferred some money from a customer's account to his. In August of the same year, a 24-year-old fourth-year University of Nairobi student committed suicide in his parents' house in Dandora. The student's body was found hanging on a piece of clothing long after he had committed suicide.